Since 2010, the Bell Let’s Talk Day has been promoting awareness and action in the field of mental health. With Olympian Clara Hughes as one of the ambassadors, the efforts to “start the conversation and end the stigma” have been celebrated and recognized across Canada and beyond. On January 30th 2019, we all have a chance to make a difference in the way we think about and act on the issue of mental illness. Explain that everybody feels these emotions at some time or other. In fact, feeling and learning how to name emotions is a really important thing. Remind students that sharing how they are feeling with someone else is also a good thing. Teach students the following short poem and have them show how their face and body would look with each line. Sometimes I’m sad and that is okay. Sometimes I’m mad and I don’t want to play. Sometimes I’m happy and my face has a smile. Sometimes I want to be alone for a while. Someone on whom I can always depend. So however I feel, please listen to me. I’ll talk to you, and you talk to me! Close by reminding students that sharing how they feel and talking (and listening) to a friend is important and helpful. For additional ideas and lesson plans, check out this site. After identifying several emotions, gather the students and remind them that sometimes we use body language to express how we are feeling as well. Discuss. Invite students to write an anonymous paragraph that describes a situation that may occur with students their age. The paragraph may begin, “Sometimes I feel…. “ Collect and randomly share the paragraphs, asking for suggestions on how to manage these feelings and also ways to help a friend who could be experiencing these feelings. Remind them that if they see someone who is displaying these actions or behaviours, it would be a good time to talk to them and let them know that you will listen to them if they want to talk. Give students the option to print “Please do not read” on their anonymous poems as some may use this opportunity to share something personal. Also explain that a “no names” rule is in effect. Discuss the term “stigma.” Explain that sometimes we put labels on people just because of the way they act or look. Review the purpose of the Bell Let’s Talk Day and ask the students what they think the term “mental illness” means. Explain that it is important to think about mental illness in the same way we think about physical illness. If someone has a physical illness or limitation, we accept and accommodate them. We need to do the same for people who have a mental health issue. The best way we can do this is to work together to stomp out the stigma that surrounds mental illness. Watch the Bell Let’s Talk video about stigma. As instructed at the end of the video, ask the students to work in pairs to think of things they can do to help end the stigma that surrounds mental health. Share. Another good resource can be found here. What do you think Emma is saying in her message? How did Emma realize that she had a problem? What did she do to help herself? What do you think Emma means when she refers to “having the courage to talk”? 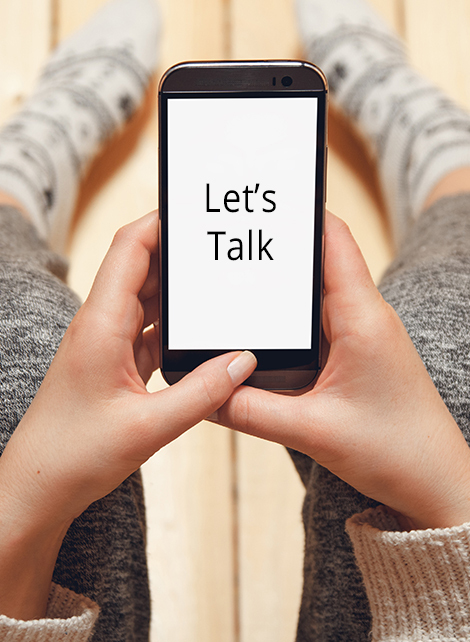 Do you believe that talking to someone when we are feeling lonely, upset, depressed or anxious makes a difference? Who would you talk to if you were feeling like Emma? Note: This may be a sensitive area for some students. To reduce anxiety, you might want to offer the option of sharing these answers and discussions with one partner or writing their thoughts down, for their own use.